“419 is just a game” cards are played by 2 or more players. The aim is to win all the cards from your opponent(s). All cards are distributed evenly among players. Each player puts his cards unseen in a pile in front of him with the image side downwards. - Each player draws the card on top of his pile. 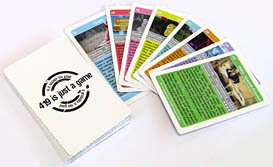 - The player who has the initiative looks at his card and determines which category his card is strongest in. - All players call their value in the chosen category. The player with the highest number wins, and gets the cards in play. He places the collected cards in the bottom of his pile, and gets the initiative. If two or more players have the same highest value in a round, there is a ‘headsup’. These players draw the next card in their piles and name the value of the SAME category as before. If a player runs out of cards during the ‘headsup’, he keeps playing his last card. This is repeated until someone wins. The player who wins the ‘headsup’ collects all the cards that were laid down, and gets the initiative.